The Virginia Beach Convention & Visitors Bureau wishes to update you on several construction projects surrounding the Virginia Beach Convention Center (VBCC) that may impact upcoming events. Underway is the rebuilding of parts of 19th Street between Arctic and Parks Avenues. This is the portion of 19th Street between the Ballroom end of the Convention Center and the oceanfront. The project will include new underground utilities, curb and gutter, pavement, some on-street parking, improved streetscapes and wider sidewalks. During this two year project the builder will keep one lane in each direction open of the current four lane road. During certain times, they may limit access to only one lane. Should this route be inadequate, alternate East West routes are available on 21st, 22nd and 17th Streets. We are excited that the end result will be a much improved roadway between VBCC and the resort area. 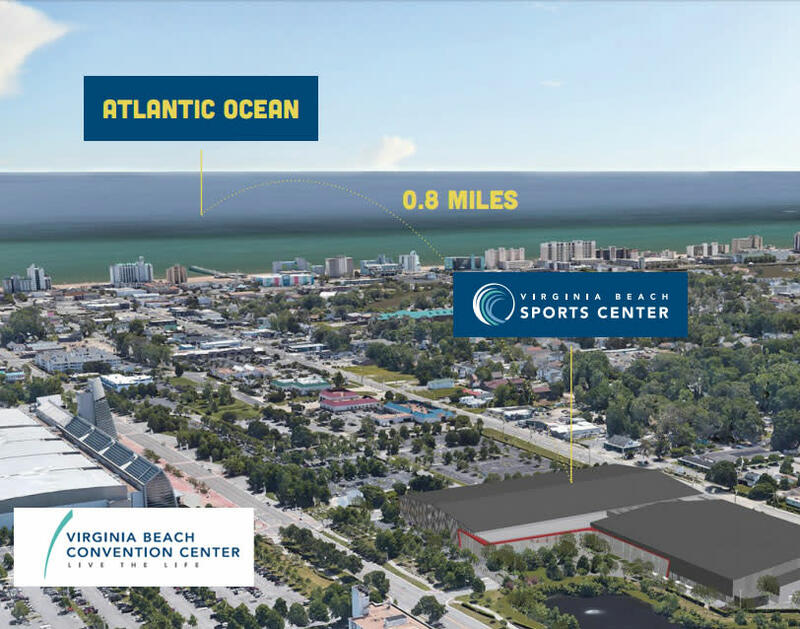 In July, the Virginia Beach City Council approved a comprehensive program to design and build a Sports Center adjacent to the VBCC to create a “convention and sports complex” environment as part of a larger oceanfront area Entertainment District initiative. The new 285,000 square foot Sports Center will be located diagonally across 19th Street from VBCC in three of our current parking lots. The Sports Center and new parking lots will be bordered by the Tidewater Veterans Memorial, 19th Street, Virginia Beach Blvd. and Birdneck Road. Additional parking will be constructed between the new structure and Birdneck Road. Clearing of trees for the new parking lots has begun and completion is expected in summer of 2019. Demolition of VBCC South parking lots, the footprint of the new Sports Center, is expected to begin in mid-October. The Sports Center is expected to take approximately two years to build. VBCC’s current inventory of 2,200 parking spaces is suitable for most events and even simultaneous events. Once completed the new campus will include a net increase of approximately 256 spaces. Until the new parking lots are constructed, however, a reduced number of onsite parking spaces may impact large events or combinations of smaller simultaneous events. We are working on alternative parking plans now to address this temporary reduction which we anticipate lasting until summer of 2019. These plans may include installing car counting mechanisms at each lot entrance which will display available spaces or lot full messages. We’ll also be placing staff on the streets and in the lots when needed to direct cars to satellite parking. Free shuttle service will transport guests from satellite lots to VBCC’s front doors when needed. We expect to direct most cars a few blocks east to municipal lots at 19th Street & Pacific Avenue, but there could be other lots. As we make these great improvements to our community, we look forward to continuing to serve our residents, our clients, our visiting guests and our industry partners. Stay tuned for more updates here.